Young & Healthy Kicks, Inc. mission is to prevent obesity in children by promoting the importance of regular exercise and living a healthy lifestyle. 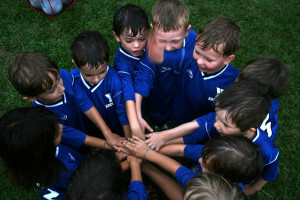 We aim to instill integrity, character, and sportsmanship in children while they have fun playing the sports they love. Young & Healthy Kicks, Inc. will organize soccer clinics for children ages 3 through 17 in Staten Island, New York. We are committed to teaching children the fundamentals of the sport. Our training activities focus on agility, balance, and coordination. The program is designed to assist children build a strong physical foundation. We aim to create a fun atmosphere where children can develop the values of friendship, leadership, perseverance, and a strong work ethic. Young & Healthy Kicks, Inc. provides clinics twice a week for one to two hours at a time. The children will be able to practice their skills and play in games. Our goal is to have approximately 50 children participate in our clinics in the first year. The fee to participate in the clinics are $60 for the four-week program and $125 for the eight-week program. The fees are used to cover the field expense, uniforms, and equipment. Young & Healthy Kicks, Inc. provides clinics year-round. In the future we hope that with increased participation we will be able to organize a youth soccer league with ten teams. With children spending more and more time watching television and playing video games, obesity is becoming an issue at an earlier age than ever before. Obesity increases the likeliness for high cholesterol, high blood pressure, and cardiovascular disease. Young & Healthy Kicks, Inc. strives to assist children avoid the consequences. Our coaches will also emphasize the importance eating healthy foods and benefits of exercising on a regular basis. Our fundraising activities include a family event in which family members of the children can participate in the practices and games that day. We will solicit donations from participants. We will also have a season wrap-up event to celebrate the best moments of the season. The fee to attend the event will be $20 to $30. Funds raised will be used to cover the operating expenses of the organization. Young & Healthy Kicks, Inc. will also sell cocker paraphernalia including shirts and pants. The price will range between $10 and $20.